A wonderful vintage two piece bikini swimsuit circa 1950. 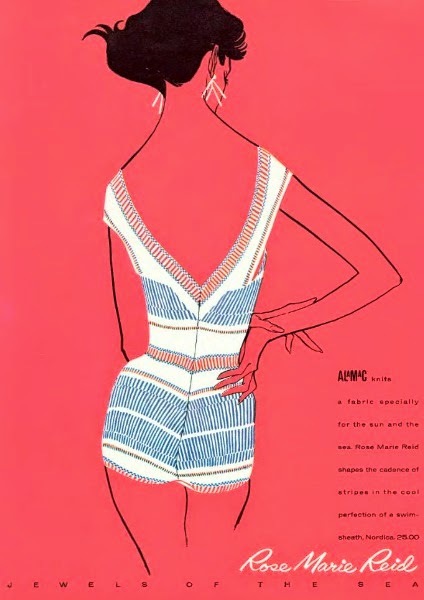 Now, doesn't that bikini bottom look like it has ties added to the outside to create a wonderful pattern mix, but then check out that hemline. This would be easy to do for a vintage swimsuit bottom that may have a couple of challenges. Hmmmm, I just may have to try this. What do you think? 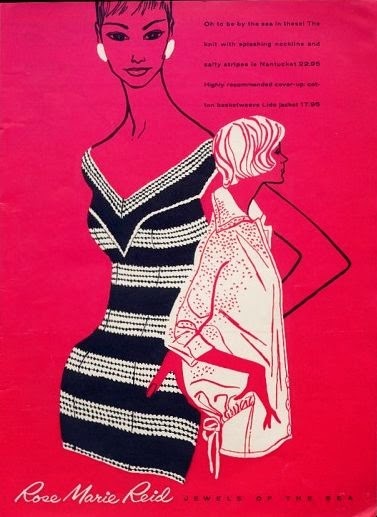 Using vintage ties of the same period would be beyond fabulous. Interesting to note that Martin White used the tagline 'telescopic suits' in the print above and he also used them in defining the type of suits in the video below. 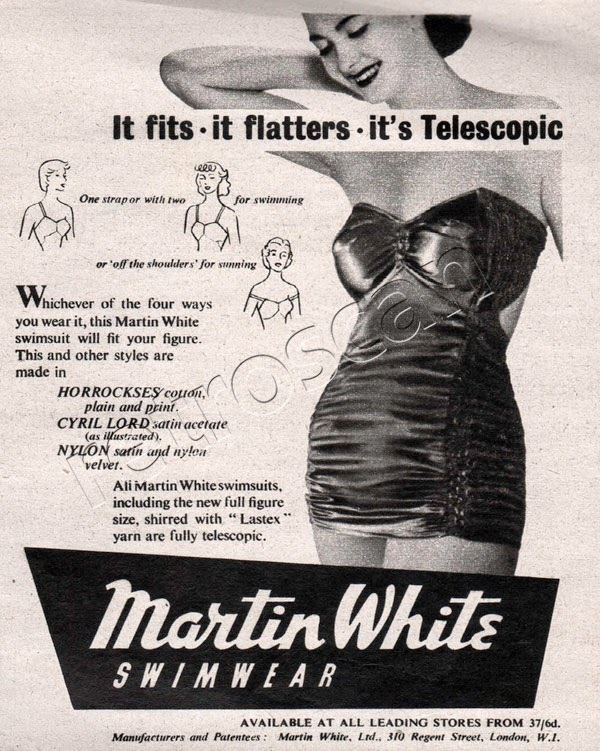 Swimwear manufacturer Martin White developed the ‘telescopic’ swimsuit in 1937 and was made on license by R and W.H Symington & Co. Ltd. 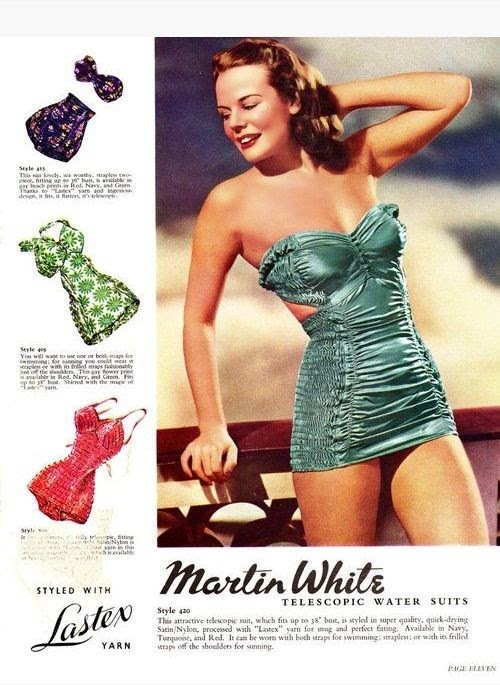 This video of Martin White swimsuits features a plastic overskirt, and on another a small bustle. 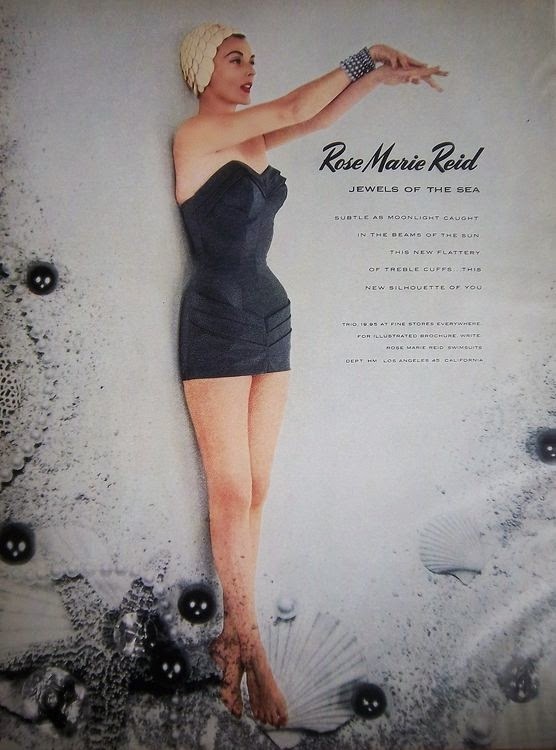 Image of Jean Simmons in 1947 modeling a satin Lastex Martin White swimsuit. I can't find out much about martin White. This last image is dated 1951 but my guess is it's really 1941 as the green swimsuit seen in the first image above. If anyone has any more info, please comment! 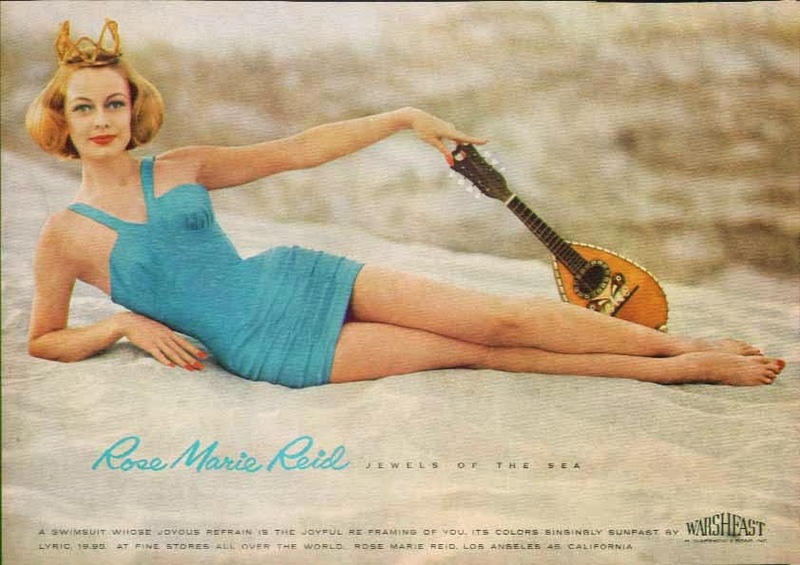 In the 1950s and 1960s Rose Marie Reid had a brilliant marketing strategy for her swimsuit line and she called it "Jewels of the Sea". These are some of the ads from that series. On a side note we will be taking a bit of a summer break. We've got some tennis elbow going on and am taking a much needed break from the keyboard. Know anyone who want's to apprentice with Glamoursurf? Drop us a line.